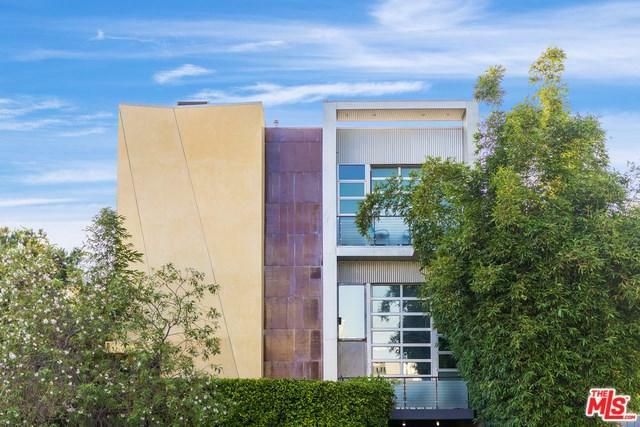 Designer-owned architectural townhouse, located in the AIA award-winning, Pugh-Scarpa building. This coveted end unit offers the ultimate privacy, multiple light-filled gallery spaces, retractable glass walls and soaring 19' ceilings. The published interior designer's personal residence includes a sky-bridge study/loft space, glass railings, granite countertops, European light fixtures and hardwood floors. The top floor master retreat offers automatic satin drapes, a custom wardrobe gallery space, a free standing tub and Carrera marble countertops. The indoor/outdoor lifestyle is seamless with its lush, bamboo-landscaped patio space and city views from the master suite balcony. Situated in the heart of vibrant and redeveloped Hollywood and only blocks from major entertainment venues, luxury shopping and fine dining. The perfect ambience of award-winning architectural design, combined with the excitement of the Hollywood lifestyle. Sold by Eliseo Arebalos of Real Estate Ebroker Inc..